To achieve our quality aims and to ensure the consistency of our products, we use only premium materials from well known manufacturers: steel from Toyota Tsusho and NKK Japan, glue from Henkel Germany, filter paper from Ahlstrom Filtration Finland, Hollingsworth & Vose USA and Awa Paper Japan. The Hiflofiltro-Thai Yang Kitpaisan factory was founded in 1955 and has been manufacturing filters for the OEM motor industry since 1963. 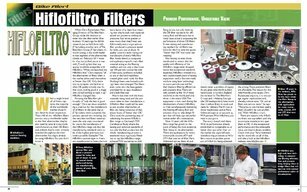 With the experience of more than four decades, continuous research and development and modern production facilities, we manufacture some of the best quality filters in the world. Every oil filter goes through 16 individual quality control checks before it is ready to leave the factory. The whole manufacturing process, including the checking of raw materials, individual filter testing, is regularly audited and verified independently by TÜV SÜD. Comprehensive stocks are always kept at the Hiflofiltro distribution centres in London – UK and Atlanta – USA, ready for immediate delivery. With an international network of leading distributors in over 70 countries worldwide, Hiflofiltro offers you a superior quality product and service that can only be envied but never surpassed. Hiflofiltro is the most extensive filter range in the aftermarket. There are applications for almost every motorcycle, scooter, and ATV that uses an oil filter. With more than two million filters in stock and ready for delivery at any given time, supply is never a problem.